Want a sample daily menu for 3 year old? Looking for variety recipes for your child who has turned three? Then you will find this post useful! 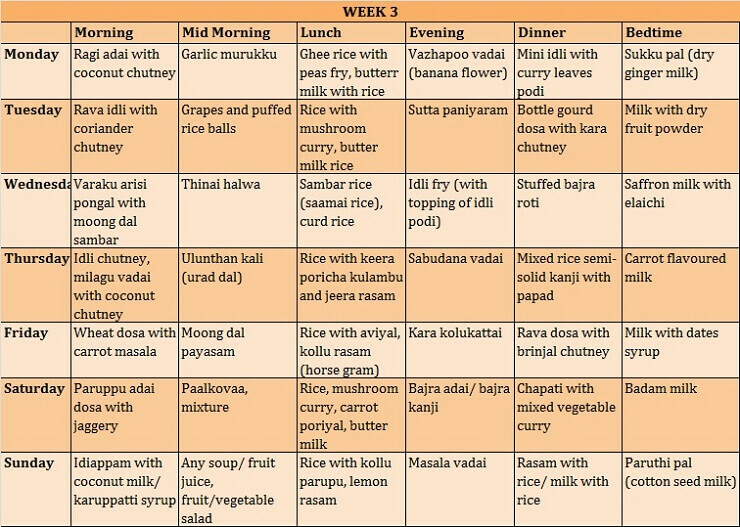 Today, I am going to share a sample Tamil cuisine food chart for your three-year-old. Something that will take away your worries about planning a healthy menu for your child. 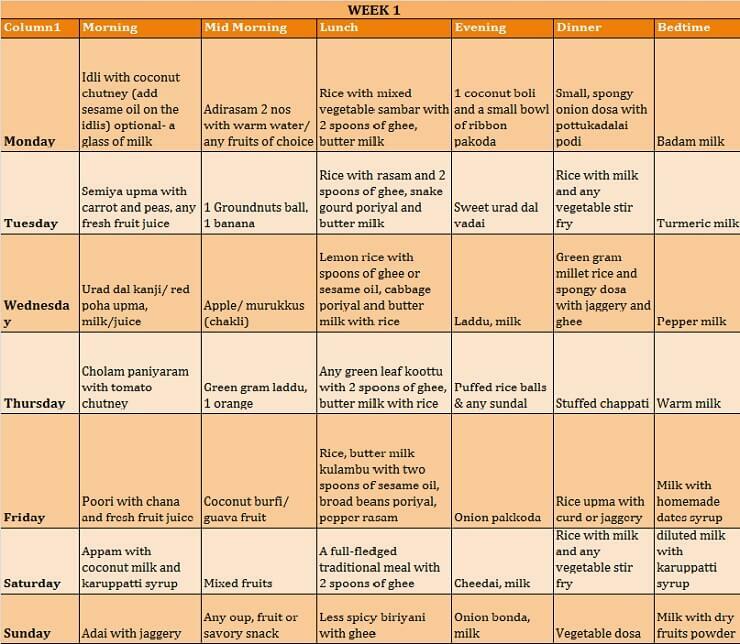 The bonus is that, this 3-year-old feeding schedule will help you to pack your child’s lunch box too! My daughter has started her schooling. So I have tried to set a routine for her in terms of her food habits. I have heard from my friends that they send the kid to school after a glass of milk, then for their break time (which is at 10:30), they have their breakfast. Now, I am not judging, but I do feel that it is inadequate. You all know about the importance of breakfast. So, to start with, I do not give her milk in the morning right after she wakes up. Instead, I start her day with warm water. Then we go about the normal routine of brushing, bathing etc. Then she has her breakfast. If she doesn’t have proper breakfast, I give her a glass of milk or juice of her choice. I am a mother who believes in all things homemade and traditional. That is why I always try out traditional recipes. And my hunt for age old recipes will never end. I usually add sesame oil to my daughter’s chutneys and sambar for breakfast and dinner. Ghee is a must for her lunch, which I add in dishes like for sambar, koottu, rasam, kulambus (adding this raw to the food will give good shine to skin and hair). In fact, this is a practice in our family. We follow a strict homemade sweets policy too! This year for my daughter’s birthday we sent groundnut burfi to the school along with the return gifts. Even our guests are served traditional sweet and snacks only. But when emergency strikes, I use biscuits. If my daughters sees a packet of chocolate or biscuits, it will get over in a minute, that’s the reason I don’t buy them at all. But in a week my daughter gets to eat one ice cream and two or three chocolates. My personal advice is to avoid giving junk foods to the kids especially at this age. Kindly avoid eating those in front of them. (I know it’s very difficult). If they can’t do without certain food items, try making it at home. You can entice them by preparing homemade sauce and dips. Whatever snacks you prepare give then a restaurant style sauce or dip. Learning to prepare snacks at home is very beneficial. I know not all moms love cooking or have the time. In such cases, it is perfectly alright to seek help from elders of your family. If that too is not an option, choose the best shop near your surroundings. My mother use to send parcels of delicacies, whenever our snacks got over. At times, she got busy and during those times, I used to shop from Grand Sweets (GSS) near my house. This is the stage they start munching on murukus, thattai,boli etc. try to reduce the intake of milk as much as possible. This works in two ways- they aren’t full with just milk and they are exposed a variety of other food items. Instead of milk, you can give butter milk, juice and soups. As I said before, I start my daughter’s day with breakfast. I usually give her milk at bed time alone. But butter milk is a must in her diet. As per Ayurveda, they say to avoid intake of solid curd, so it is best to take it in the form of butter milk. I know many kids love curd with potato poriyal, but this is one of the reasons that cause obesity in little ones. Anyway, I know you are eager to read the chart, so I won’t keep you from it. 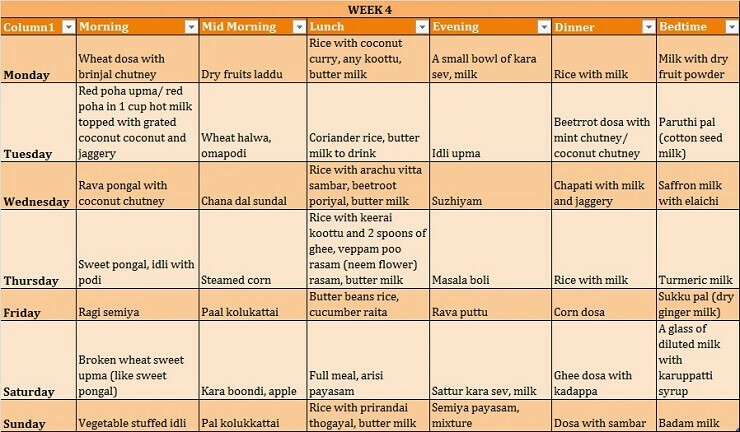 So as promised, here is a 3-year-old feeding schedule, for 4 weeks, according to Tamil cuisine. Moving on to the 2nd week. Let us start the second half of the month with some interesting choices for your 3 year old child. And now, for the last week. This is a pure vegetarian chart. Kindly research on food and habits which will suit your family according to your region and culture. Except in the places where I have mentioned ‘buttermilk to drink’, offer the buttermilk mixed with rice. It is always advised to add sesame oil, ghee, coconut oil over the food you serve. (1-2 teaspoons are enough). Ghee helps to enhance the taste of sambar, kulambus, rasams and helps to bring to the spice factor. Similarly, sesame oil has the same effect on all type of chutneys and for plain idlis. Sometimes we mix poriyal with rice, add spoon of ghee or sesame oil and eat. Try include coconut milk in your diet because it’s the only food with health benefits similar to the mother’s milk. We consume coconut milk with appam or idyapam, twice week. As I said before, homemade sauces and dips complement and elevate dishes to a new level. So I have an easy to make sauce and dip recipe each, for our lovely readers. 1. Dilute 300 gms of karupatti in half a liter of water and filter it. 2. Add 5 gms of dry ginger powder and 5 gms of pepper power. 3. Mix well and start boiling it. 4. When it turns a little thicker (like syrup), turn off the stove. 5. Let it cool and transfer to a glass bottle or any container. Add one spoon of this syrup to a glass of milk. You can use this as a dip for idly, dosa, upma, chapati, poori, etc. This is very healthy for the kid, when compared to the store bought health drink mix. This is a very simple and easy recipe, not to mention very useful too. It will last for three days. 1. In a mixer jar add a few tomatoes and 1 spoonful of pepper or garlic, and make a fine puree. 2. In a pan add any oil and crackle a few cumin seeds. 3. Add the tomato puree and water. You can add one glass of water for one glass of puree. 4. Simmer it on a very low flame till the mixture reduces to a quarter of the actual quantity. 5. Add jaggery powder and wait till it reaches a sauce like consistency. Now the tomato sauce is ready. This can be used as a side dish for idli, dosa, upma, chapati, poori, and for snacks like murukkus too. If you saw this in the chart and wondered how to make it, I have the recipe right here! 1. Mix half a spoon of dry ginger powder to one glass of milk. 2. Boil it, add jaggery and mix it well. 3. If necessary, you can add a pinch of pepper too. Always keep some dry ginger powder at home. Try to avoid white sugar. Do try to reduce intake of plain milk. Try to prepare home remedies with the products available at your home. Avoid packed and processed food. That is all mommies. 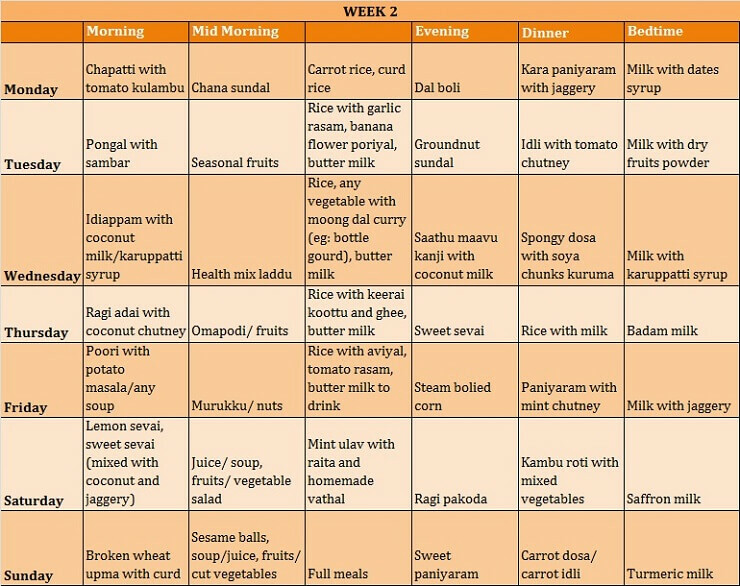 I have tried to keep a 3 year old’s nutritional needs in mind while preparing this sample menu for 3 year old. Do let me know if you have any doubts and I will clear it for you. What all do you give your 3 year old? Also, is there any special recipes or tips that you would like to share with us? Madam,Pls upload traditional south indian menu for 6yr old.My 6yr old daughter weighs only 15kgs. Start giving chutney instead of milk Padma.